More than a place to sleep, the master bedroom is designed with comfort for the whole family in mind. Decorative beams, a stone fireplace, and a sliding barn door give the living room a rustic feel. A long front porch with a metal roof links the home’s two imposing gambrel-shaped gables. An outdoor dining room is located just steps from the pool and hot tub. Sheltered under the back porch, a living and dining area allows the family to gather outside for much of the summer. Below the second-floor master suite balcony, the pool, hot tub, and sitting and dining spaces converge for a multifunctional entertaining area. A barn holds two parking bays, a recreation room, and a fitness center, while at the same time creating an elegant entrance experience to the property. Its charming gatehouse look reinforces the French estate feel the homeowner requested. In the master bedroom, burlap-clad X benches from Safavieh flank the cane bed. The large room also holds a sitting area with a settee dressed in Lulu DK fabric and a pair of fanciful swan side tables from Serena & Lily. Paintings by local artists Daphne Chapin (top) and Pat Pratt speak to the surroundings and the owners’ lifestyle, which includes boating whenever possible. 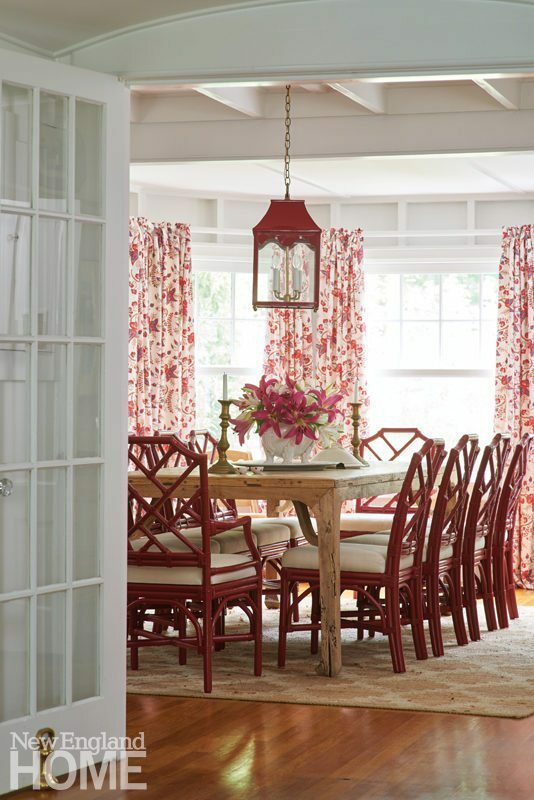 Rylee favors tall lamps like the antique duo bookending the living room sofa. Leather ottomans add texture to the scene, and cozy touches such as a monogrammed blanket from Maine’s Swans Island Company help enrich the room’s stay-awhile appeal. Happily, the 1920 retreat’s classic shingled exterior had been rejuvenated by the previous owners when Rylee and family arrived. An existing hedge affords the outdoor sitting area privacy. To boost the ambience in the personality-filled porch along the front of the house, homeowner and designer Leslie Rylee paired the swing (devised with help from Kay Sloan, a friend whom the designer labels “jack of all trades, seamstress, and facilitator extraordinaire”) with old-time treasures like antique lamps and an end table decorated with wooden spools. A guest bedroom also provides ocean views, as well as breezes. Designer Dennis Duffy designed the resin-topped dining-room table and the buffet. Patinated bronze anchors the ethereal glass drops of the dining room chandelier. Furniture is simple and clean-lined. Maritime-inspired cables support the bubbled-glass staircase panels. The owners fell in love with the house in part because of its views, which include iconic Maine landmarks such as the Isle of Shoals and Boone Island Lighthouse, the tallest lighthouse in New England. Original details such as coffered ceilings and dark-stained floors blend with modern elements like the fireplaceâs stone facing. Plantings and stone terracing enhance house and property. 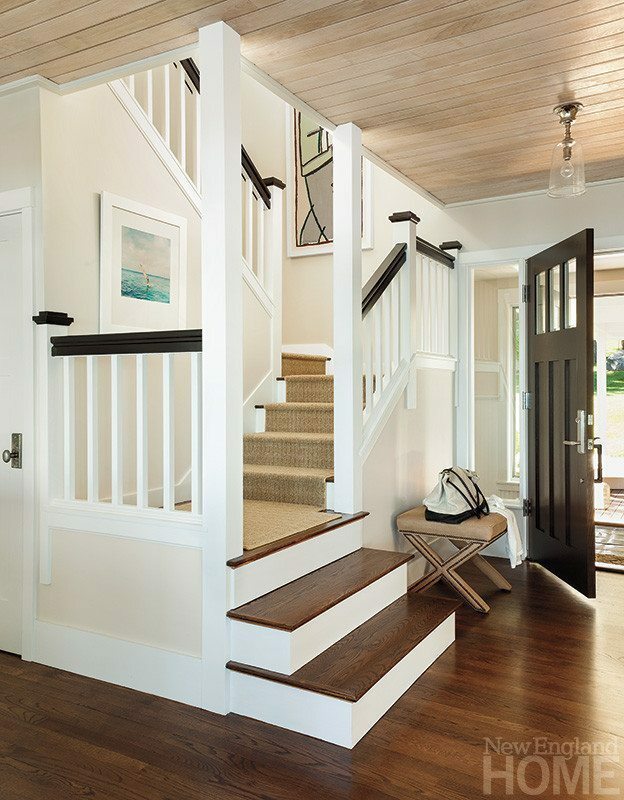 After a century beside the ocean, virtually the entire exterior of the house needed replacing, from new cedar shakes to the rot-proof trim. Its original appearance, however, remains. Delft tiles enhance the fireplace in the master bedroom. Halpern had coral box-framed for the master bedroom. Architect Dean Telfer designed the paneling in the "snug." The nautical painting comes via London. A quiet corner makes a perfect spot for tea. An antique Welsh dresser holds a growing pewter collection. A new deck off the kitchen makes a ­picture-perfect place for casual dining. 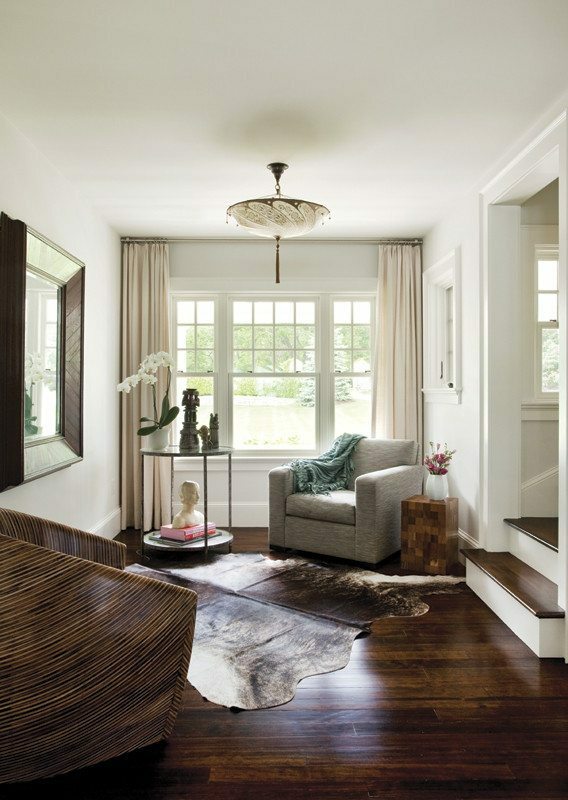 Homeowner Dolores Halpern designed the drawing room’s sofas and coffee table. The dining room’s eighteenth-century corner cupboard hails from Maine. Boaters have easy access via the dock. Those staying behind on the covered porch can monitor comings and goings. The owner’s yacht ties up in view of the house. In the bunkroom, each bed has its own reading light and book cubby. A built-in blackboard fosters games and fun. Horizontal paneling transformed the wall behind the ownerâs bed. Water views initially drew the couple to the house. 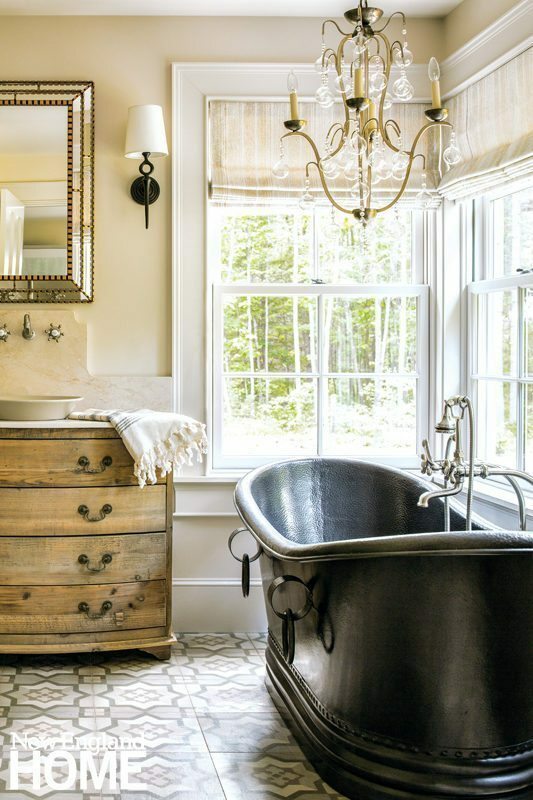 A pickled wash subdued the paneled ceilings without disturbing their nautical flavor. When the wall came down between the old entry and what had been a solarium, the house gained openness and light. Today’s new dining area links the kitchen and family room with the living room. For continuity, transom spindles mimic original spindles found elsewhere in the house. The aesthetically pleasing covered walkway between the house and the garage provides protection from the elements. A vibrant painting by America Martin hangs above the fireplace. Designer James Light campaigned to save the wood box during the revamping of the fireplace. âIt provides symmetry, which I like,â he explains. The master bedroom was designed as the ultimate retreat. Landscape designer Larry Maxim and the homeowners agreed on a low-maintenance plan that includes native shrubs, trees and flowering plants that provide color and textural interest in every season. Wildflowers are part of the overall natural landscape design. The entryway connects the home’s two discrete pavilions. Deep overhanging eaves temper the hot summer sun and help protect the Ipe siding from weather. The living room gets its modern, industrial feel from the wall of aluminum-framed windows and concrete flooring. Upholstered seating and a Chilewich rug soften the commercial feel of the flooring and define the sitting area, while the views bring in all the color the homeowners need. Creeping and wooly thyme between the cobblestones add softness to the courtyard. A detail of the bathroom barn door. A pipe railing along the upper bunk in a daughter’s bedroom sounds a creative note. Boating, swimming and docks to leap off make this the perfect spot for family fun. A low vintage coffee table is the perfect height for sitting on the living room’s plush striped rug and playing board games by a roaring fire. The stonework edging around the base of this classic Maine camp was inspired by the original structure’s chimney, a nod to the history of this special place.